set.a.light 3D V2.0 STUDIO is the world's first photo studio simulation, with which you can build lighting sets in advance on a PC and realistically simulate the expected picture results. 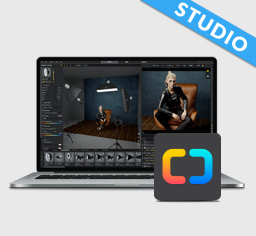 The photography studio simulator for photographer. Easter Offer until Apr. 23.
set.a.light 3D V2.0 - OUT NOW! With our lighting simulation we've always wanted to improve the work of photographers and make it more efficient. Thousands of customers all over the world trust in set.a.light 3D. set.a.light 3D simulates a whole photo studio including everything you need to build up your light setups. Visualize creative ideas, try out sets in advance and transfer them into professional and astonishing results in your studio. Who wants to strenously move around his heavy equipment by himself and in the meantime having to let the model wait? That's exactly where we're we come into play. We want to create a tool that enhances the everyday work of photographers and lets them live out their creativity - that's why we started developing set.a.light 3D back in 2012. Now, it's bigger brother, named set.a.light 3D V2.0 is on the market. The new software developed into a new and fully overhauled energy-packed beast - our baby has grown up quite a bit. Get thrilled by the flexible and new contents and feel, how much easier your planning will be. With its new features, you too can achieve amazing results. improved workflow & higher work efficiency. The make-up doesn’t fit to the desired look? The software has different make-up styles to choose from. The “glow” of the skin can be adjusted precisely as well, just like the hairstyles. What is to come later on? Of course, we will deliver more additions via later updates. In a free update, we plan to add windows and windowed light for the studio. You might also get more clothing variants and interieur. Many more improvements and extensions will be released step by step. Updates are available for FREE. Updates contain extensions, patches and fixes of errors and improvements of the software. They will be delivered inside of the product life cycle.